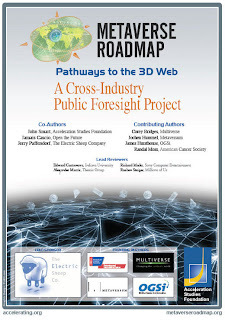 Its not often we say this, but ‘The Metaverse Roadmap: Pathways to the 3D Web’ is one of the best reports we have read for a long time. Written by a cross industry group of authors it provides a balanced, informed and educational overview of virtual worlds, digital earths and the concept of the MetaVerse. Taking its name from the immersive virtual world imagined by Neal Stephenson in his visionary novel, Snow Crash, the Metaverse Roadmap (MVR) is the first public ten-year forecast and visioning survey of 3D Web technologies, applications, markets, and potential social impacts. Areas of exploration include the convergence of Web applications with networked computer games and virtual worlds, the use of 3D creation and animation tools in virtual environments, digital mapping, artificial life, and the underlying trends in hardware, software, connectivity, business innovation and social adoption that will drive the transformation of the World Wide Web in the coming decade. The MVR explores multiple pathways to the 3D enhanced web, not a single path to a “3D-only” web. An array of 3D web enhancements are emerging, visual extensions to the participatory web technologies.